Well, he went and did it. He got himself a ship. And now it's his duty to steer his ship towards calm seas and take care of his crew. Do you think he's up for the task? He might not have the experience to lead a ship into new waters, but there is something we can do to give him an edge for his new mission. 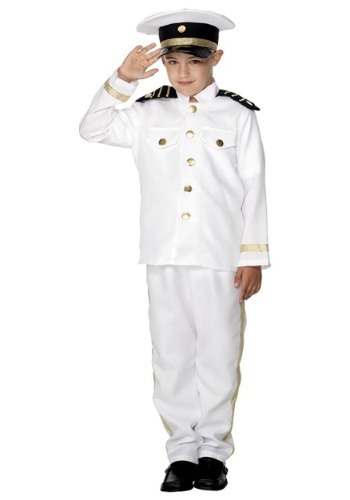 We can get him a super duper captain costume! Yes, he can explore the world from the bridge of his ship, or carry his passengers around the world with expertise when he sets course. As long as he has the confidence to become a tip top captain! "Clothes make the man" as they say, so get him a cool captain look by outfitting him with this spiffy kid's captain costume. With a look this cool, we're sure he'll be ready to set sail! Styled as a jacket and pants combo along with matching hat, this set has all the gear he needs to take command on the ship's bridge. Gold trim is featured on the cuffs, epaulets and in tuxedo style stripes down the side of the pants. Decorative plastic buttons have a gold finish for the right effect, and coordinating cap seals the deal and makes it look super official. Have him ready to set sail, and we're sure he'll be just the man to lead his crew across the ocean. Well, we should say little man. There's nothing wrong with being on the small side when you're running a ship. In fact, we think he'll be the best captain ever!